Successfully Added LED Light Belt Buckle - Cyberpunk Design to your Shopping Cart. Large skull belt buckle with square window slot to hold the included LED light module or your own items. 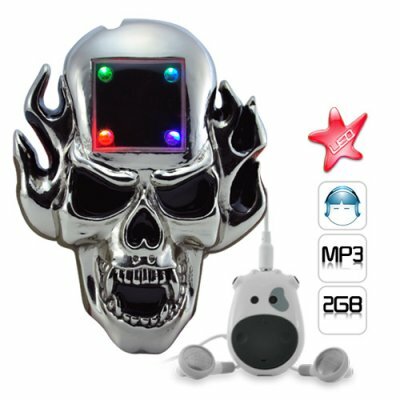 This is the improved version of our famous "LED Light Belt Buckle - Punk Skull Design", our new Cyberpunk version includes a Cow MP3 Player so cyber cowboys, hackers and slashdot.org readers can enjoy Lady Gaga and Jonas Brothers music. Just when you thought belt buckles were a thing of the past, we have forged for you a new cast metal one with a modern skull design that has a unique window compartment for holding a multi-color LED light module, stylish Cow MP3 Player, or your own art/accessories that are 40mm x 60mm or smaller. This package includes the cast metal belt buckle, LED light module and MP3 Player - all that you need to enjoy your new belt in style. Use it just as a regular belt buckle, a multi-color LED light belt-buckle, an MP3 player, or a holder for your own personal property, the choice is yours. What else can you do with this punk skull belt buckle? Do you have to walk through dangerous a neighborhood at night or hang out at a rough bar? Then we have found the perfect clothing accessory for you. If anyone gives you trouble, just give them a skull in the face! That's right, this belt buckle is so solid you could take it off and use it has a handheld weapon. Wear this unique belt buckle with pride of ownership. A low wholesale price make this a great high profit re-selling item for featuring in your physical or online store. Sure to be an item of interest, order stock today from your favorite drop-shipping wholesaler - Chinavasion.